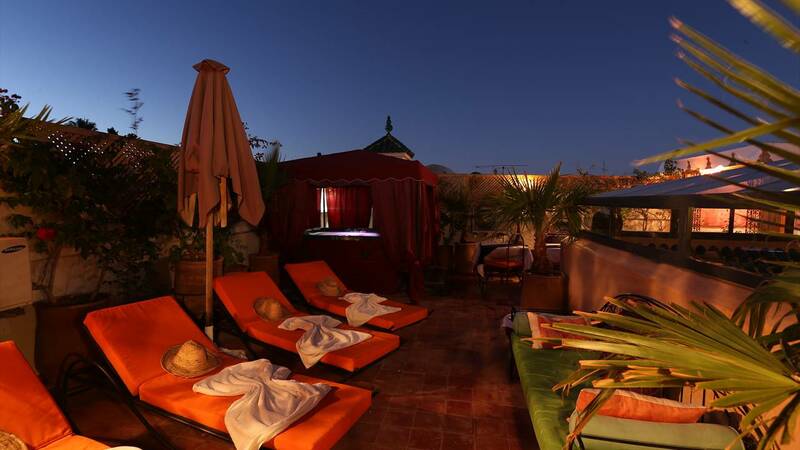 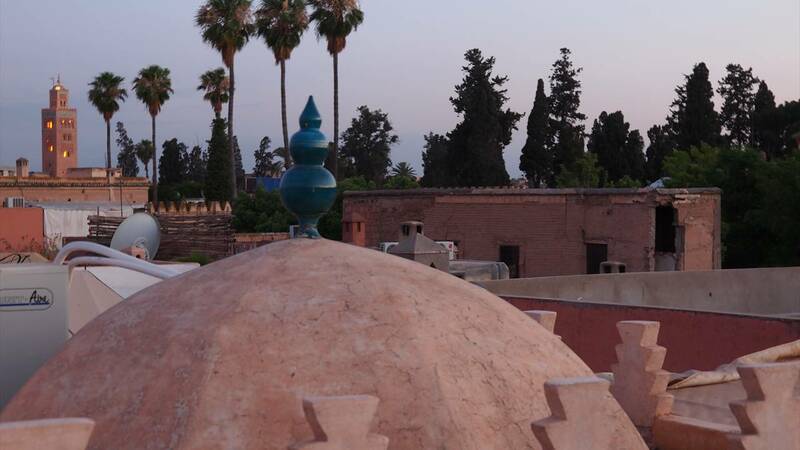 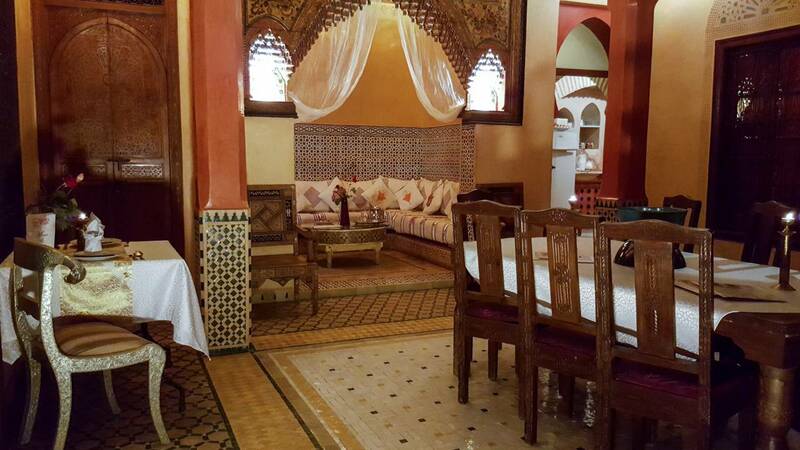 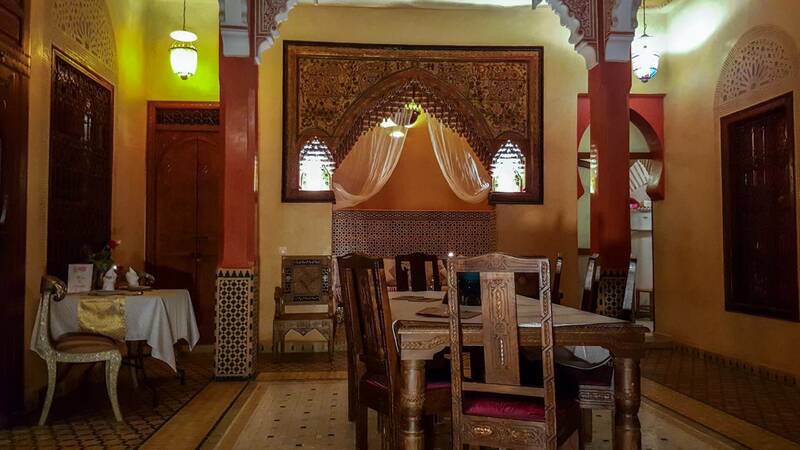 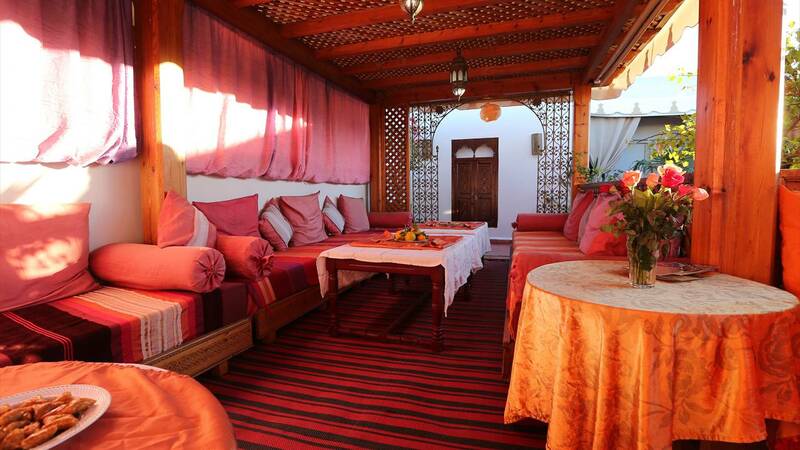 The riad offers 6 rooms. 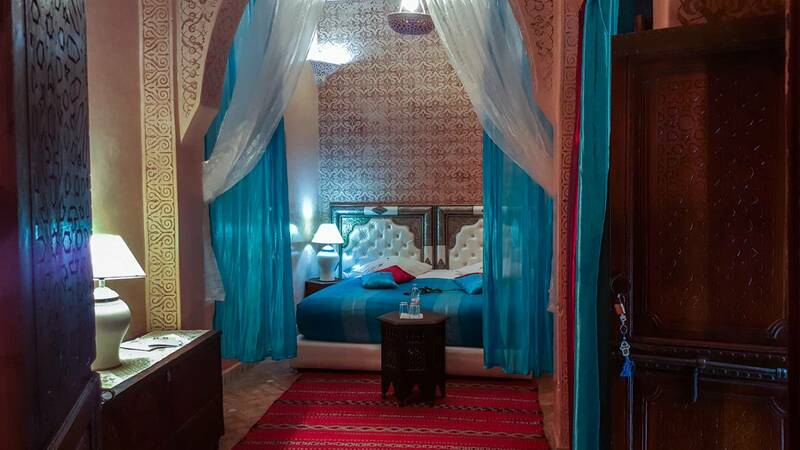 Suite Samira and Opaline room in the ground floor. 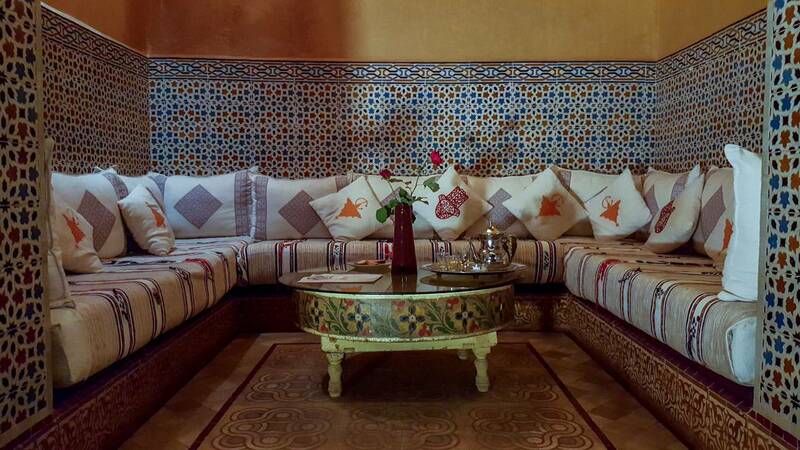 Ambre, Jade, Pierre de Lune and Saphir are in the floor of the riad. 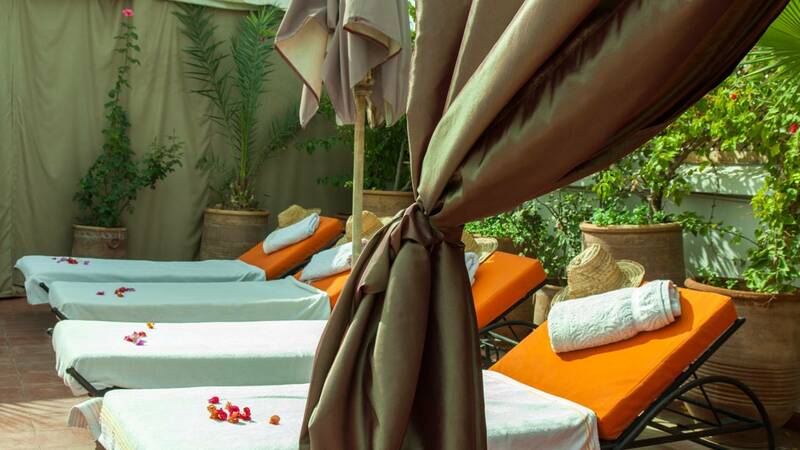 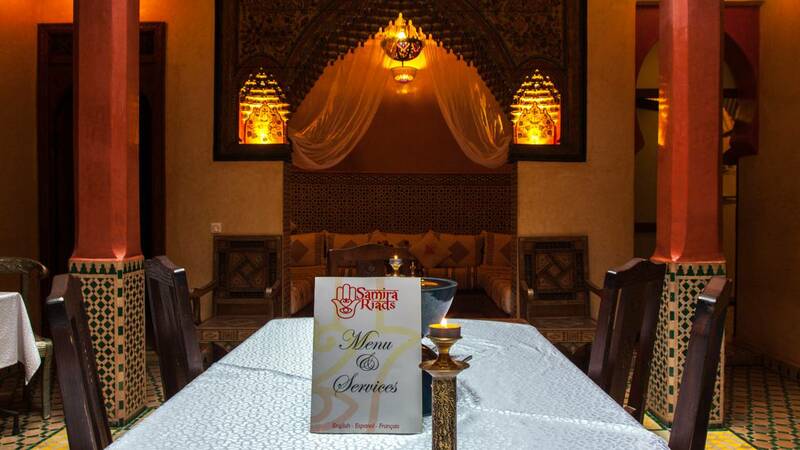 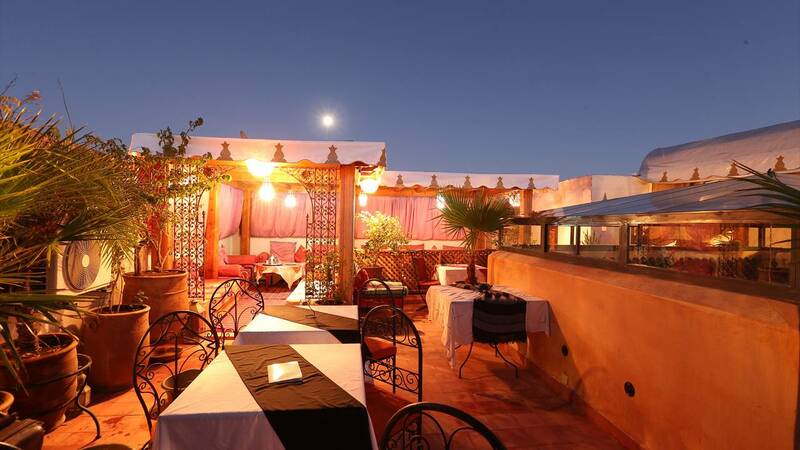 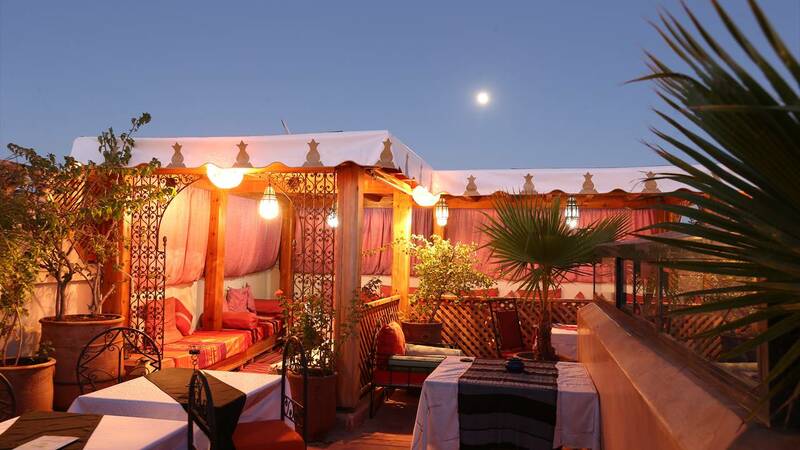 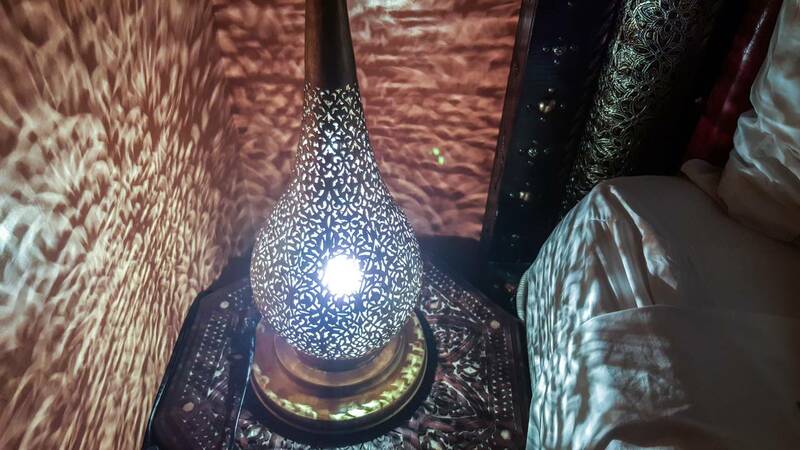 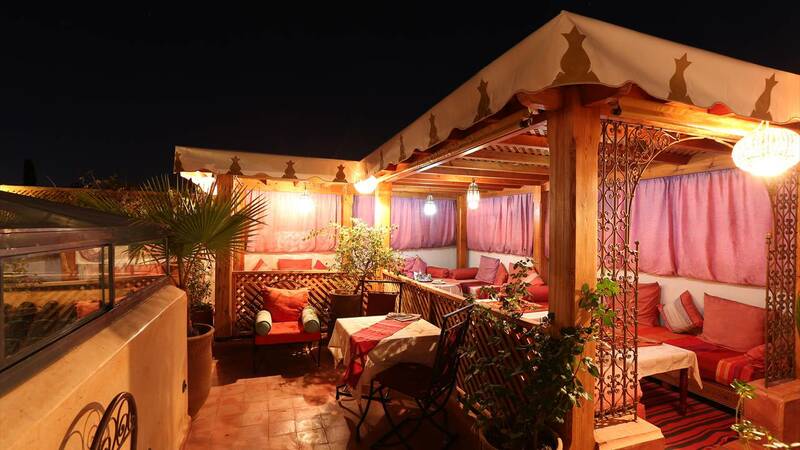 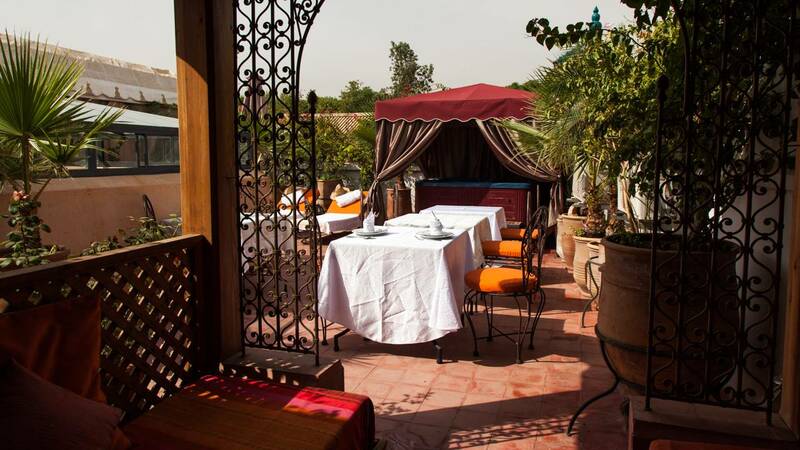 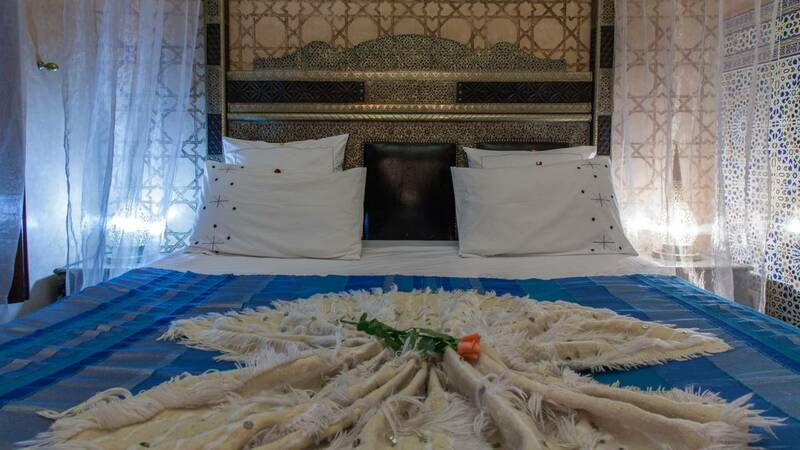 Luxury – just steps from the famous “Jemaa El Fna Square” with all of its life and charm is what we can offer our guests at Riad Rêves d’Orient. 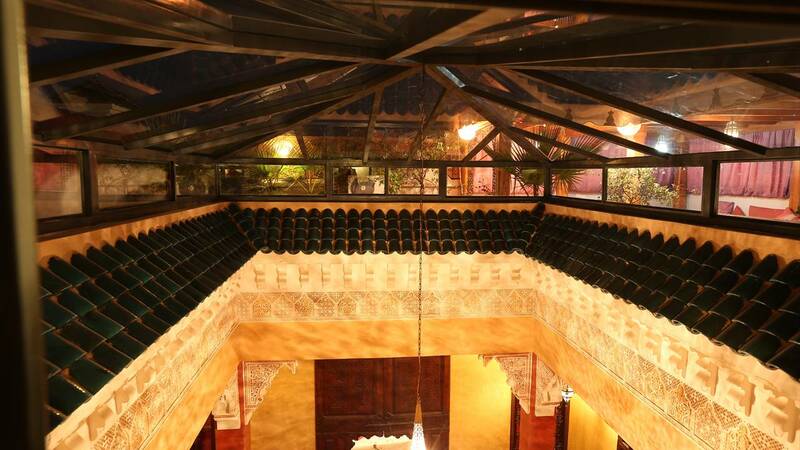 The riad is refined and enchanting, and you will open its doors to an oasis of calm and serenity including the wonderful spa on the terrace. 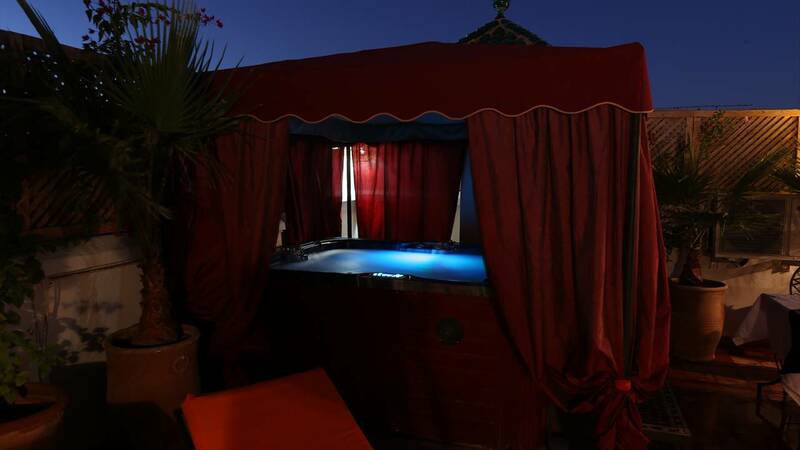 The jacuzzi will give you some unforgettable memories as you gaze at the stars. 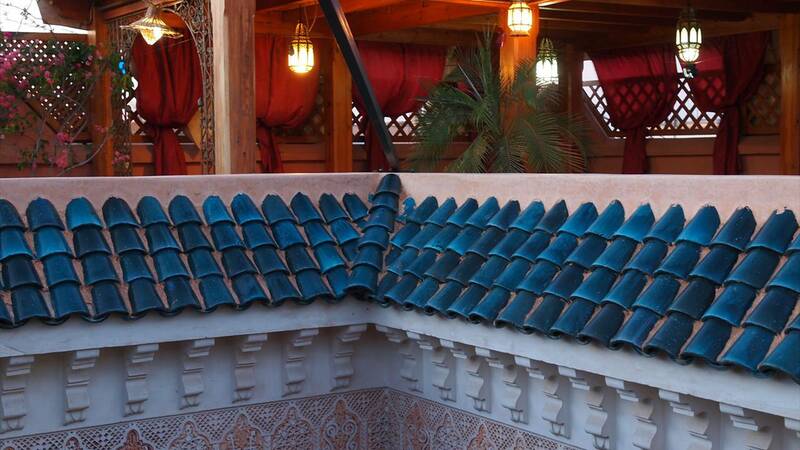 The patio designed in the tradition of Arab-Andalusian art will provide you a heaven of tranquillity when accompanied with a mint tea. 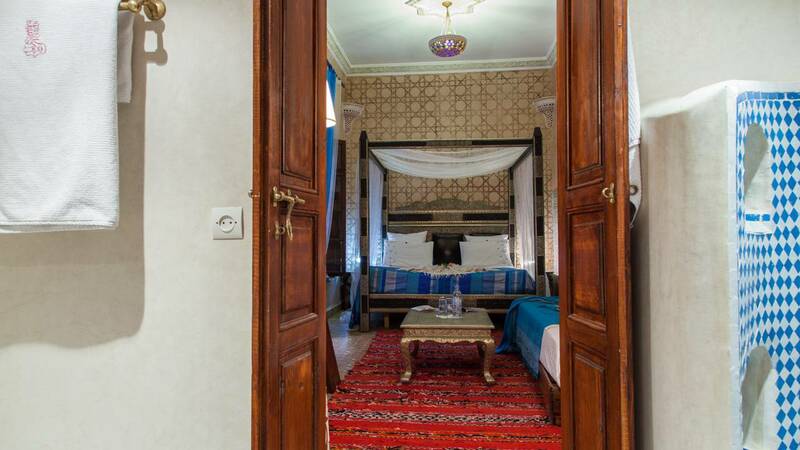 The accommodation will provide you with a very comfortable stay – mainly composed of suites, and all are equipped with plasma TVs too. 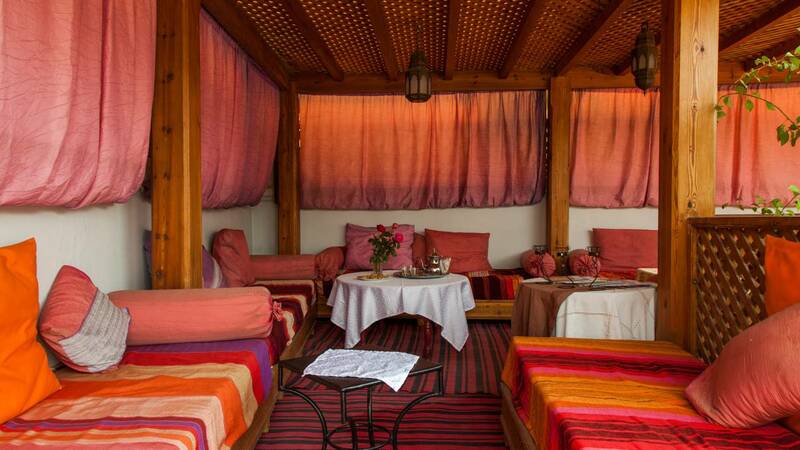 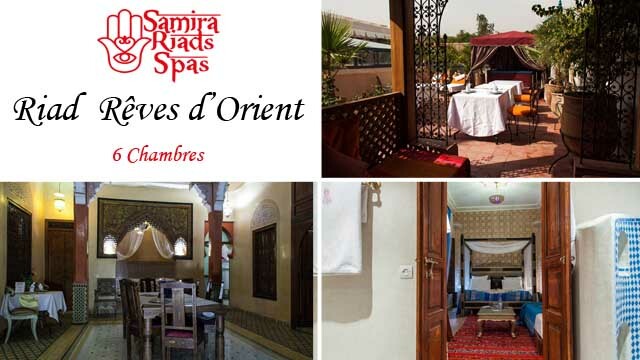 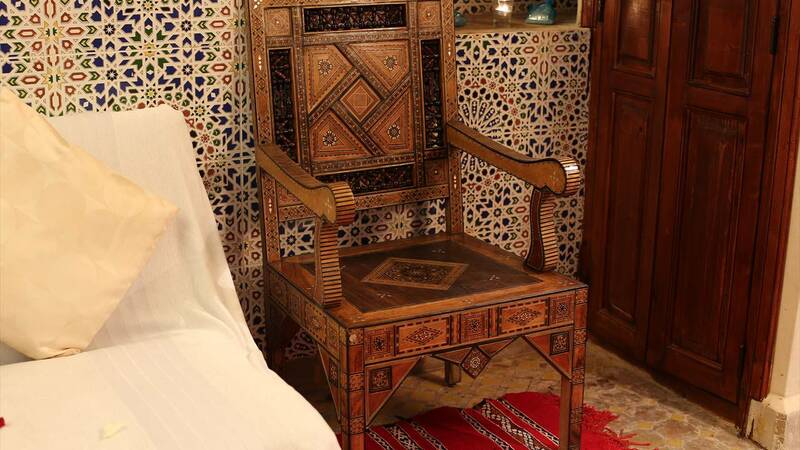 Riad Rêves d’Orient therefore is the perfect place for family visits (family room) and couples (romantic suite). 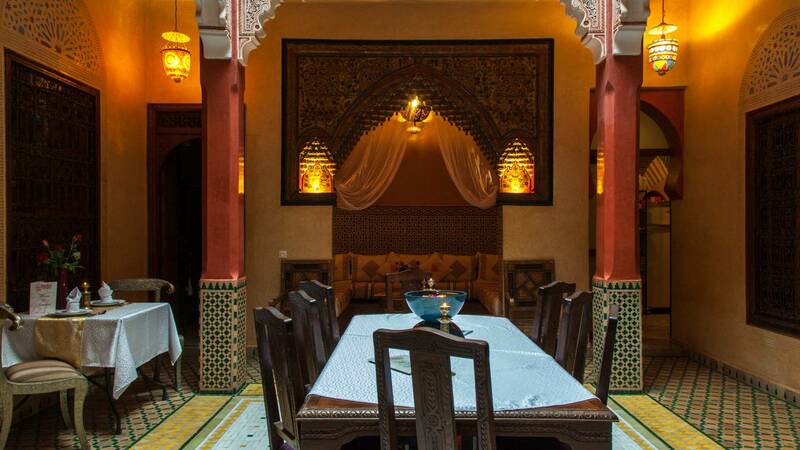 Breakfast is included in the price and we offer complimentary Moroccan mint tea or coffee with homemade cookies at all times. 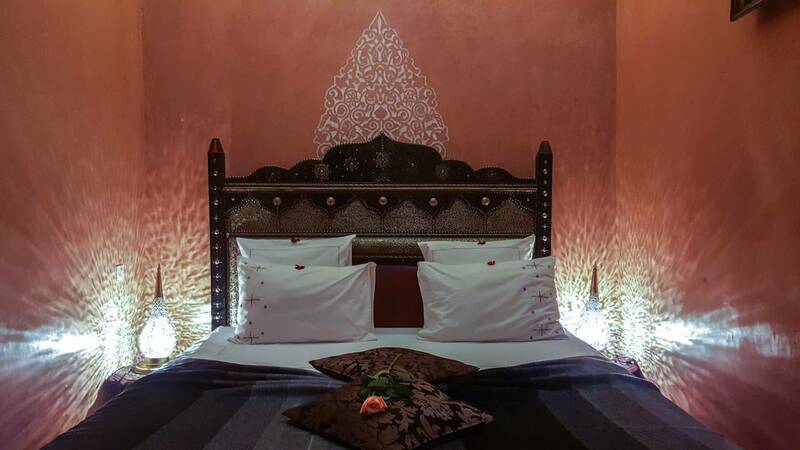 The Amber room includes a double bed. 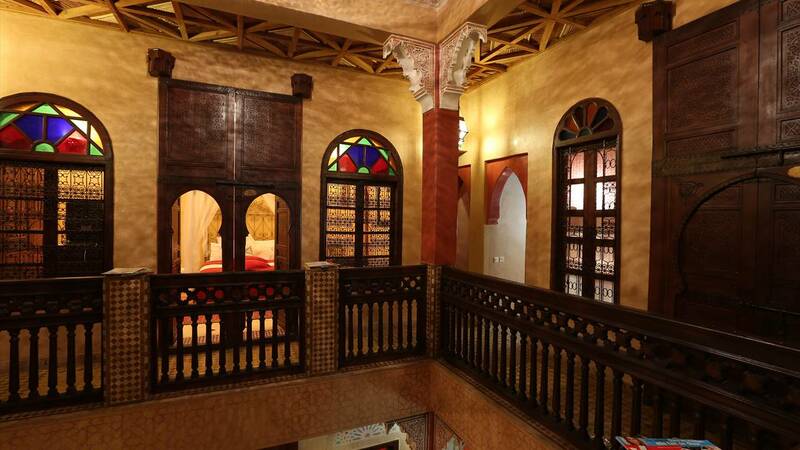 Located in the 1st floor, it can possibly accommodate a third person with an extra bed if required. 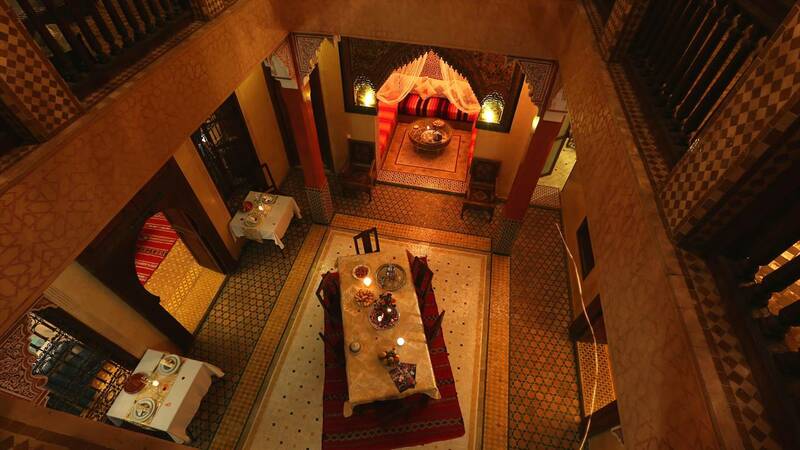 In any case, it is a very romantic room. 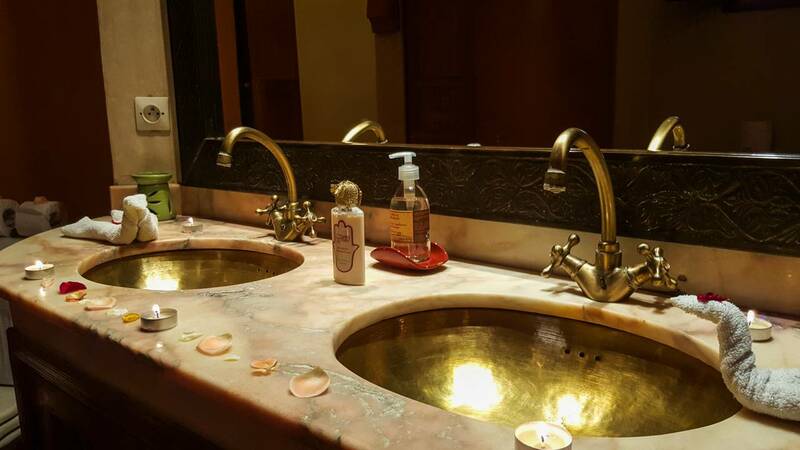 The bathroom with shower is equipped with a hairdryer. 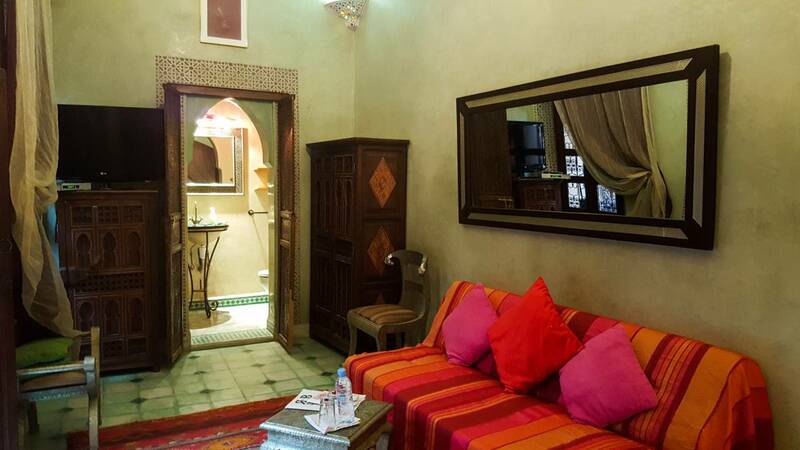 The room also includes a plasma TV, wifi and a safe too. 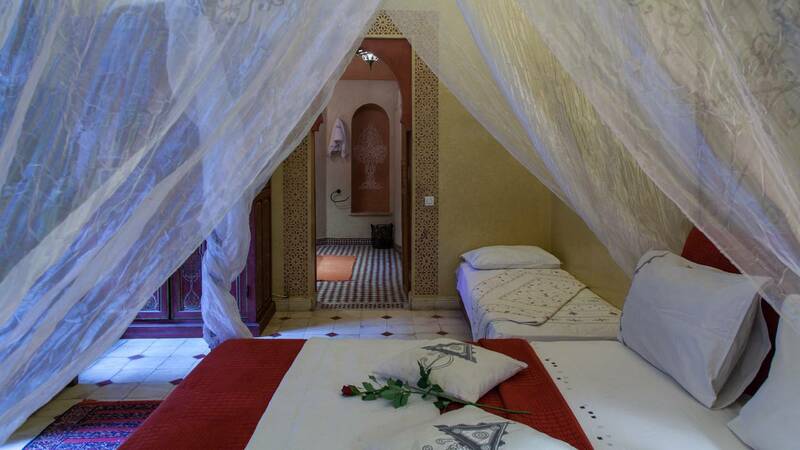 The Jade Suite includes a very large bed (2mx2m), it is located in the 1st floor and has a very romantic feeling. 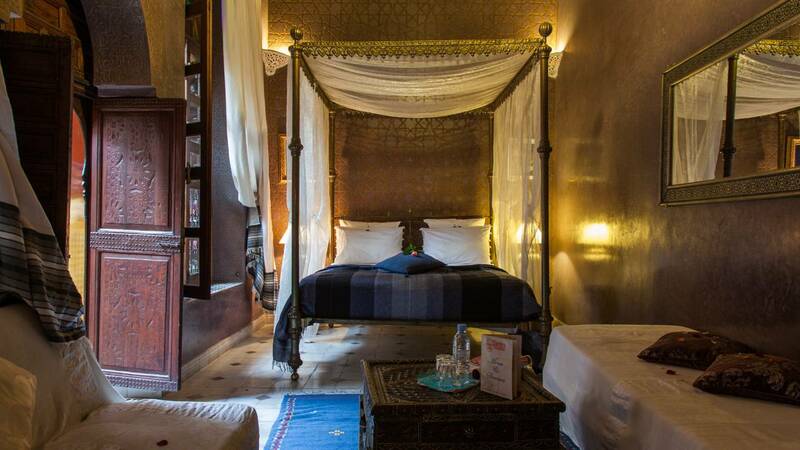 There is the possibility of adding an extra bed for a third person as well. 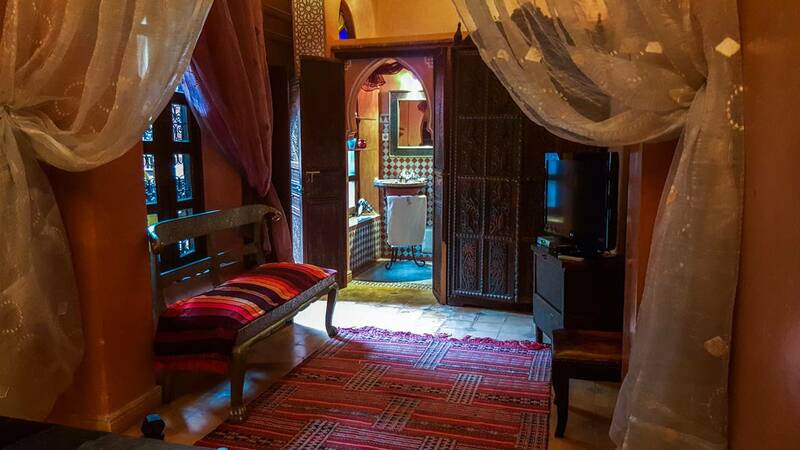 The bathroom with shower is equipped with a hairdryer. 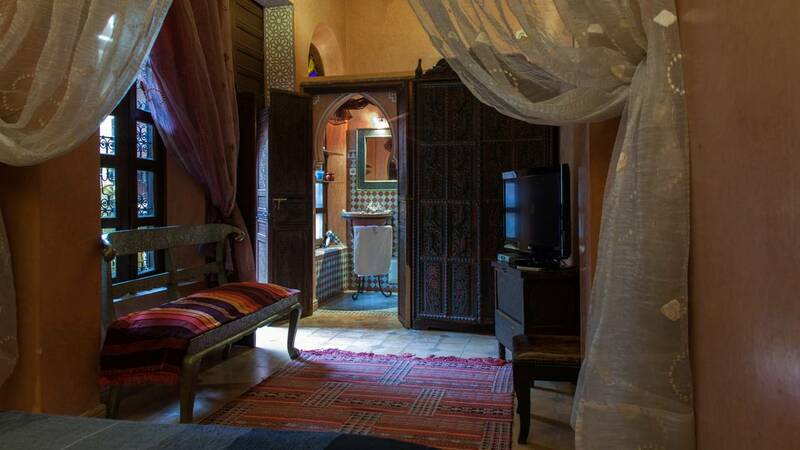 The Suite also includes a plasma TV, wifi and a safe too. 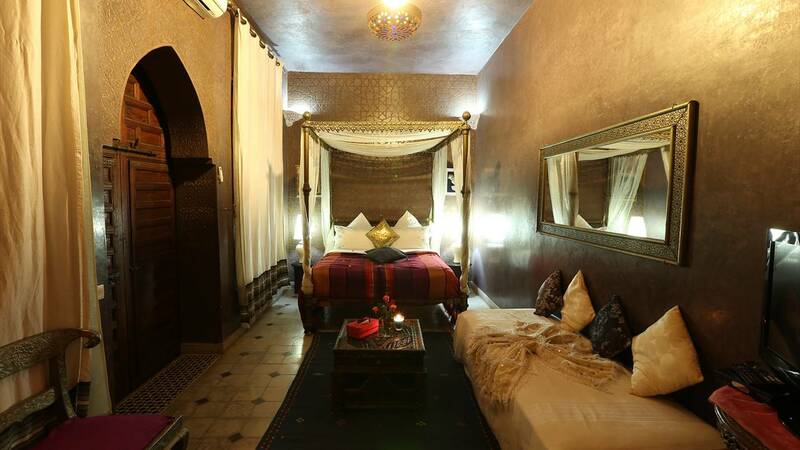 Opaline room includes a double bed which can also be split into 2 separate single beds. 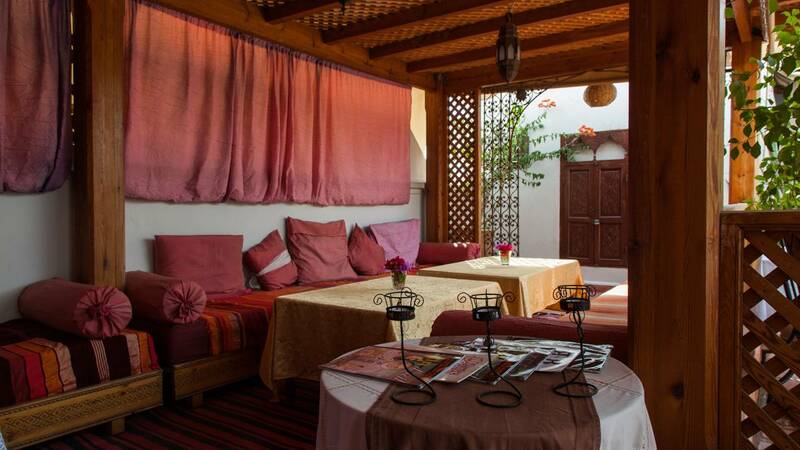 Located in the ground floor, it also offers the possibility to add a bed for a third person. 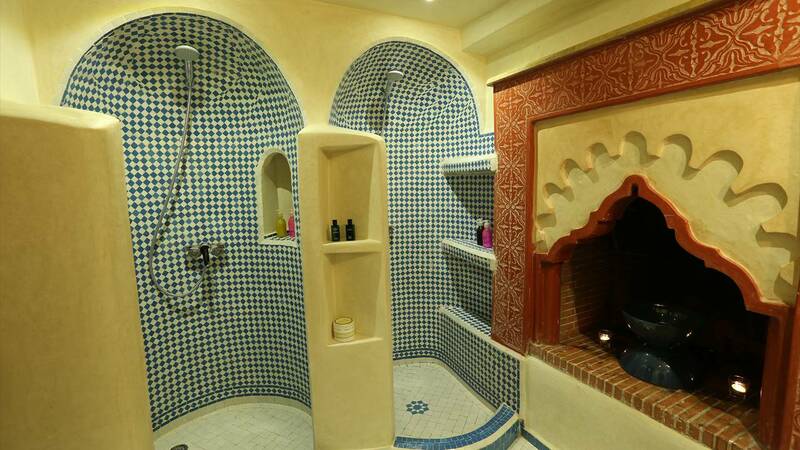 The bathroom with shower is equipped with a hairdryer. 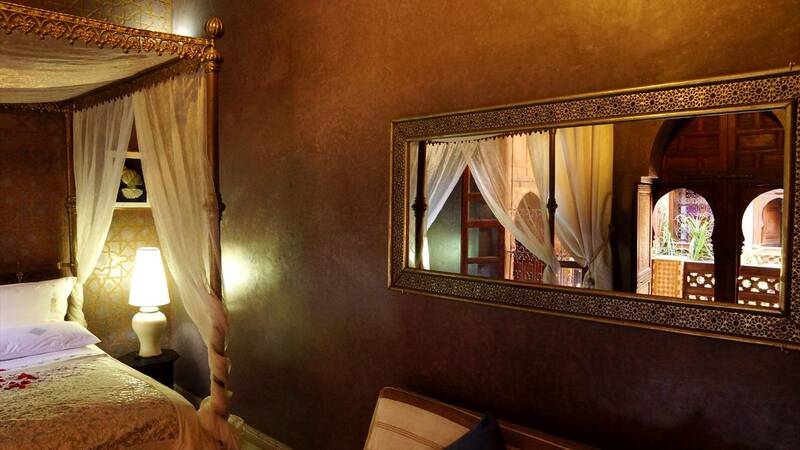 The room also has includes a plasma TV, wifi and a safe too. 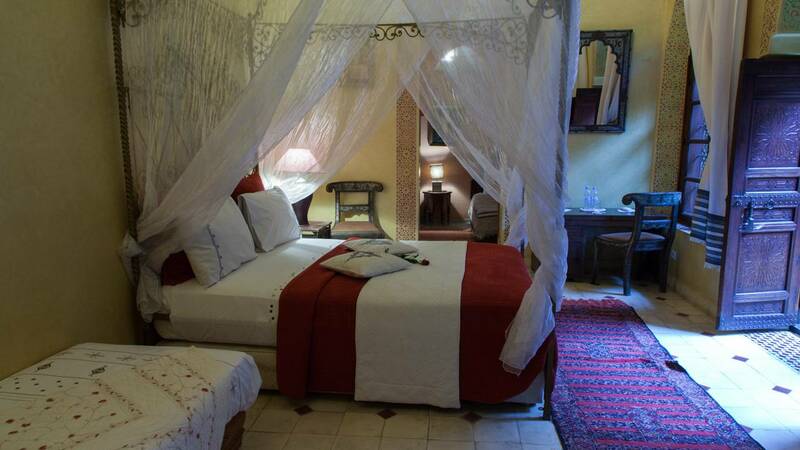 Pierre de Lune Suite includes a large four-poster bed which gives it a romantic feeling. 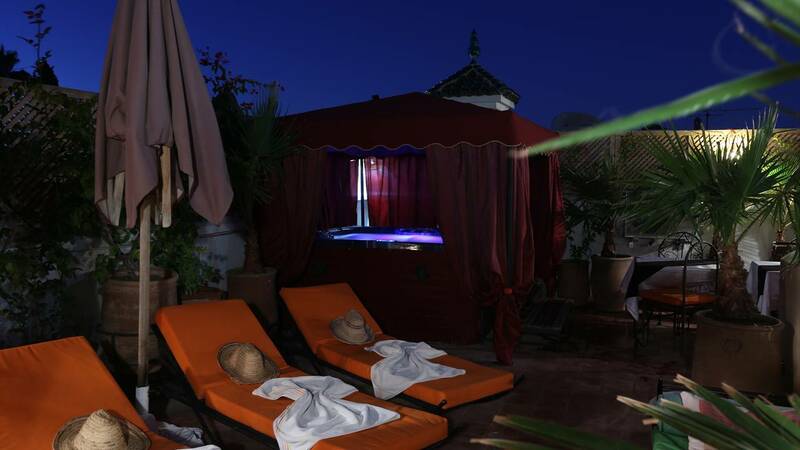 Located in the 1st floor, it also has an option of adding an extra single bed if required. 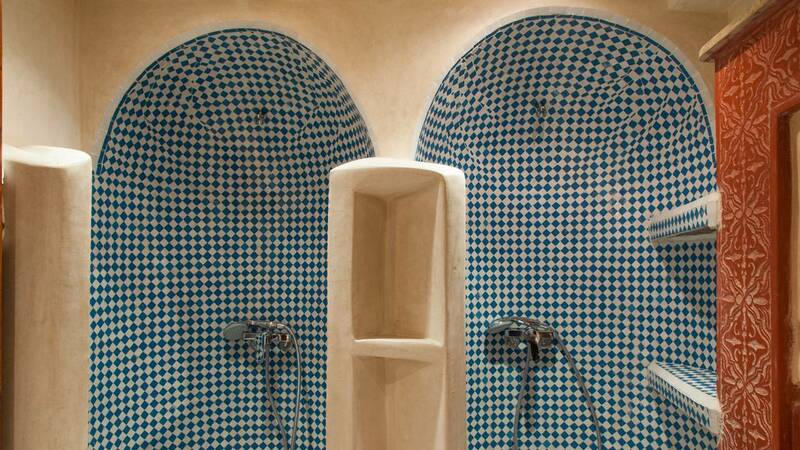 The bathroom with shower is equipped with a hairdryer. 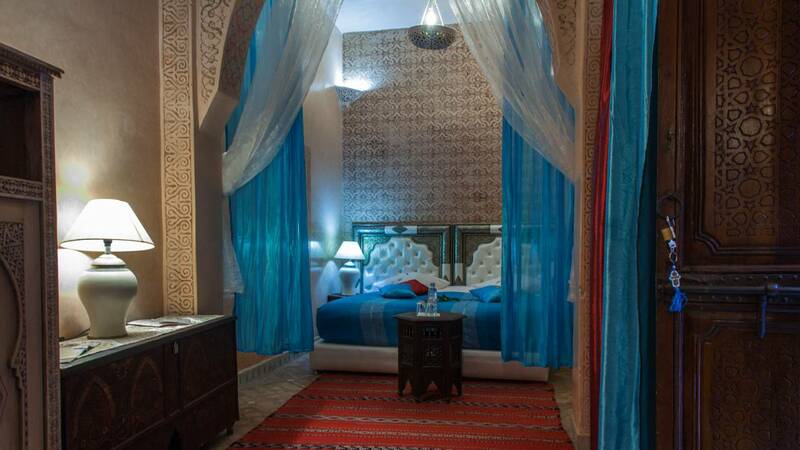 The Suite also includes a plasma TV, wifi and a safe too. 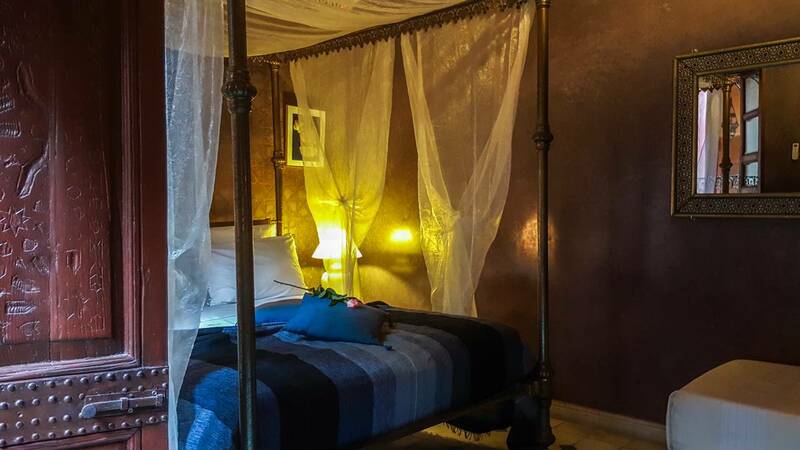 The Samira Suite includes a four poster bed providing a lovely romantic setting. 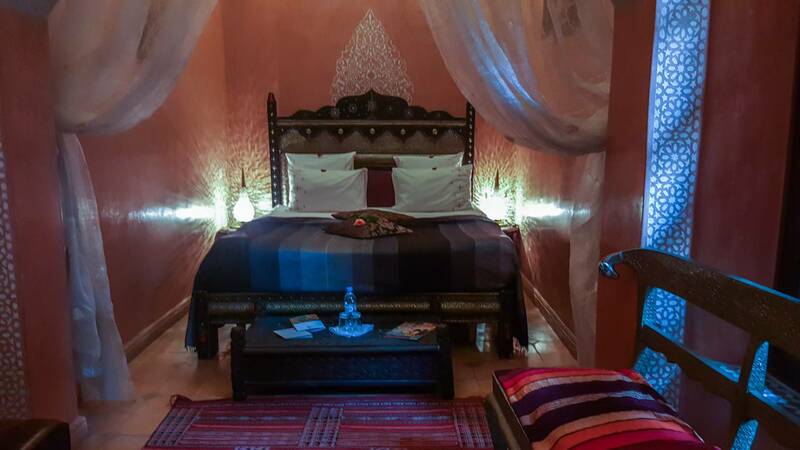 Located in the ground floor, it offers the luxury of a second connecting room with 2 separate beds. 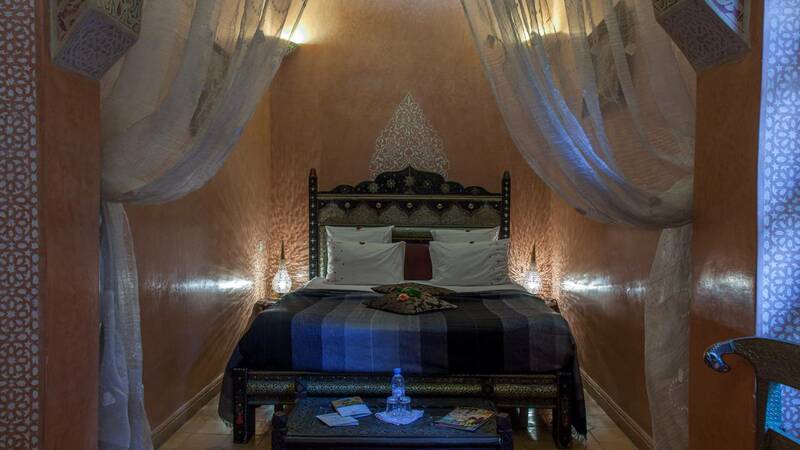 It is also possible to add an extra bed, so the Samira Suite can accommodate 4 or 5 people and is ideal for families. 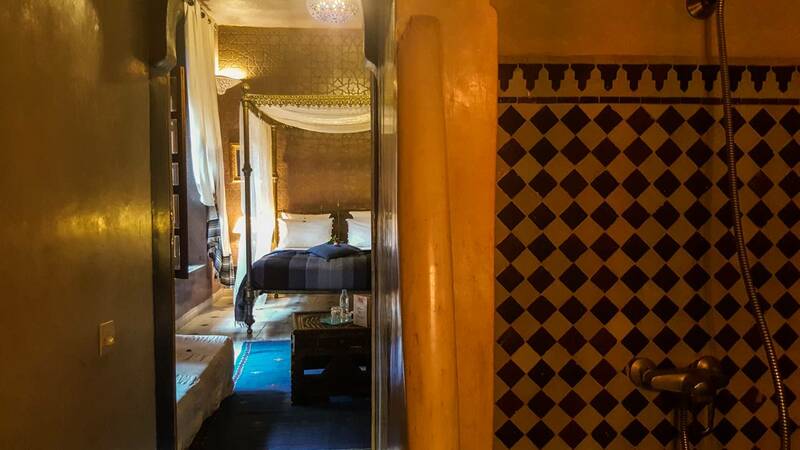 The bathroom with 2 showers is equipped with a hairdryer. 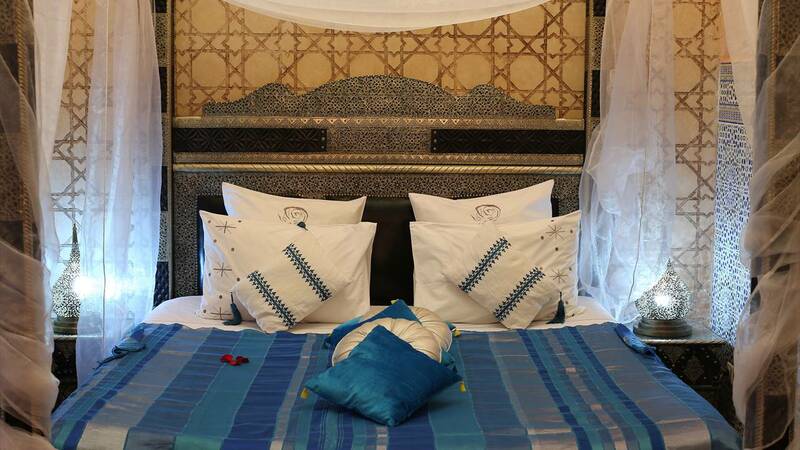 The Sapphire Suite also includes a plasma TV, wifi and a safe too. 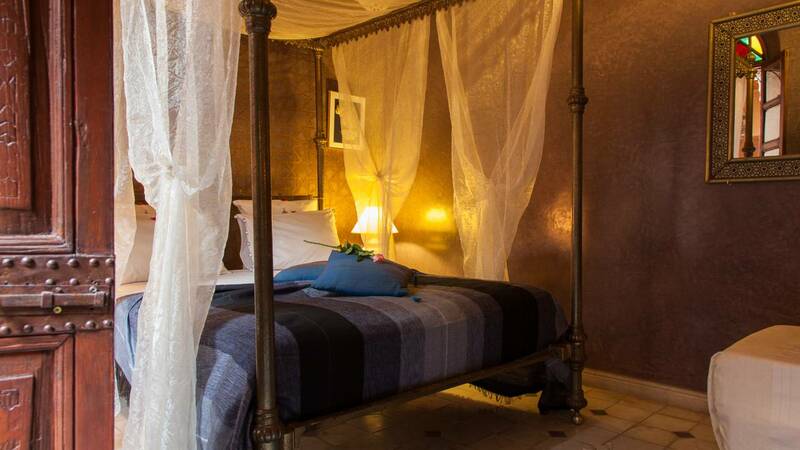 The Saphir Suite includes a four poster bed providing a lovely romantic setting. 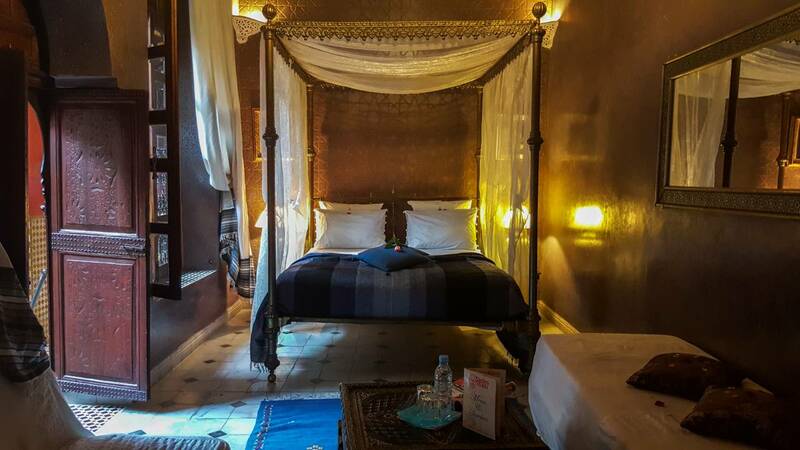 Located in the 1st floor, it offers the luxury of a second connecting room with 2 separate beds. 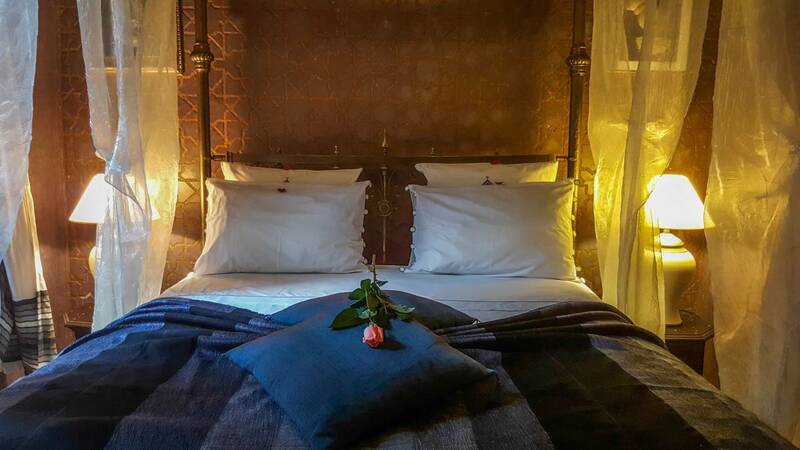 It is also possible to add an extra bed, so the Saphir Suite can accommodate 4 or 5 people and is ideal for families. 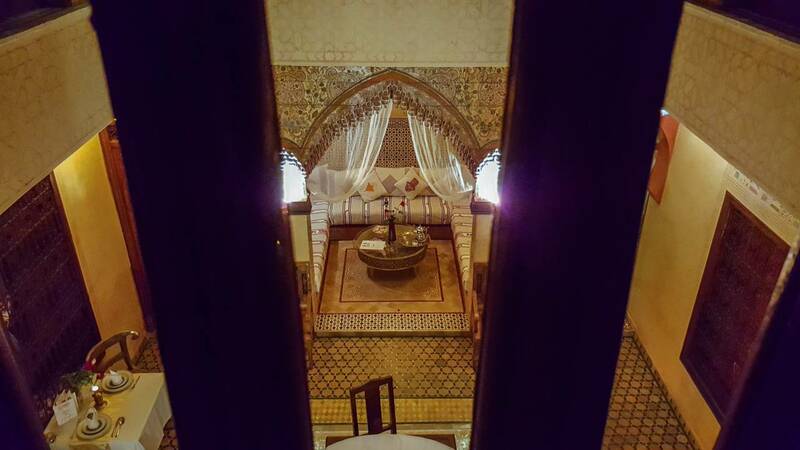 The bathroom with shower is equipped with a hairdryer. 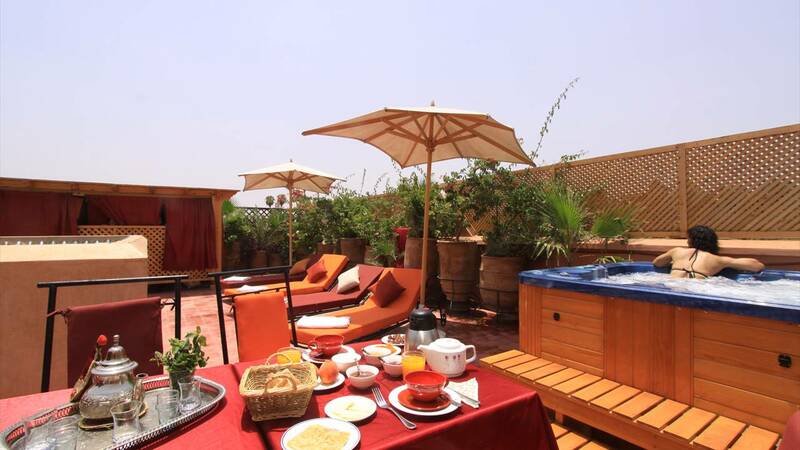 The Suite also includes a plasma TV, wifi and a safe too.